I have posted before about some of the ways that we have displayed Jack's art in the past (here and here), and I thought that it was high time that our smallest family member had a chance to make his mark on the family 'artwork'. I set the boys up with just a few colors of paint, some 12x12 canvases, and a paintbrush. If I am being honest, Luke was maybe a smidge too young for this. He LOVED painting, but I had to constantly be right beside him to run interference on paint-eating. Jack helped me find a 'perfect place' to hang their creations once they had dried, and I have to say...I am loving them! He was SO excited to show them to Matt when he got home from work. For reference, that is the door to the downstairs half-bath (which is the bane of my existence by the way, but more on that later). 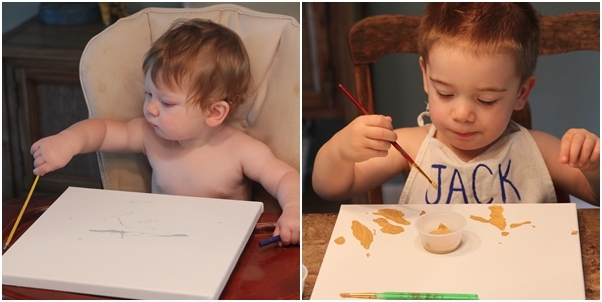 Here is one more for the grandmas - Jack's artwork is on the left, Luke's on the right! It is nice to finally have some of Luke's handiwork up on our walls to go along with our Jack art. I love filling our house with pieces of 'us'. adorable! and you are BRAVE! Thanks! I figure the worst that can happen is paint on the floor, and that can scrub off! Agreed, I love it too! Ohhh yes, by the end of this Luke had paint in his armpits, but he had so much fun! Awww! It looks great! I love the way they turned out! This is a great idea! Hopefully I'll remember this when Ada is older.